What's up, you guys?! It's Wednesday, and time to get on with our COTD hump day...with NO camels in sight! ...so we a look at the Amber Dragon series today, huh? So the Amber Dragons are from Set 4, which makes them part of the Gen 2 Ride Chain series where if you hit the first part, you automatically gain the next part. As a Ride Chain, it's not the best that's out there, but with Dauntless Drive Dragon about to come out in 2-3 days, it's definitely breathing in some much needed life into the fire. As for Dusk here, he's a base 9,000 when he isn't the Vanguard, which is rather disappointing as any Grade 2 from a Ride Chain normally is, but as a Vanguard, he gains a rather nice power boost as he can basically be anywhere from 11,000-12,000 depending on if you are successful on the Ride Chain or not. Like all Gen 2 Ride Chains, Dusk gains an extra 1,000 power if you are staying devoted to the chain without fail, and when he attacks as Vanguard, he gains a nice 2,000 bonus. In the previous format, where it was rampant with Cross Rides, this would be a teaser seeing how you needed to be at 13,000 to be able to pose a threat, but now that most people are going to Break Rides, where their base stat is 11,000, it gives cards like this potential. Amber Dragon Dusk, otherwise known as the grade 2 of the Kagero ride chain. Personally, I hvae not been too fond on ride chains. The specifics involved in pulling off their abilities sometimes put a hinderence on how players want to play a clan(BUT, there are exceptions). 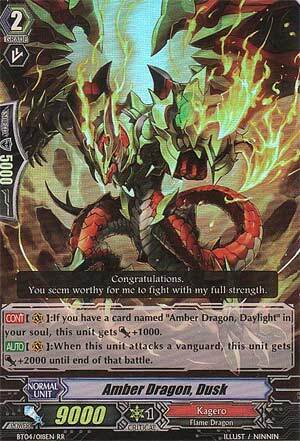 Amber Dragon Dusk has basic stats: Grade 2, 9000 Power; but all this card screams at me is early game beatstick. If you pull off the ride chain correctly, your vanguard can swind for 20,000 in one turn (with the correct booster). Overall, the kagero clan has Overlord The End and with their break ride card recently recently, I doubt the Amber Dragon Series will be seeing much play.